Since the advent of the commercial internet, Stephen Woessner has collected tens of thousands of data points that have given him the ability to identify what he calls the 8 Money Draining Mistakes. These are the things that literally cause a website to leak serious money…every day. Stephen teaches companies and organizations how to fix them…and how to fix them immediately. Stephen also teaches how to apply what he calls the 8 Money Making Opportunities. These are the things that really matter because they increase financial return on investment in the digital world by 200 to 500 percent or more in 12-months or less. And all of this can be done without needing technical skills. 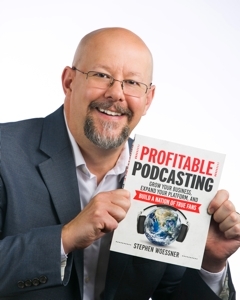 Stephen is host of the Onward Nation podcast, CEO of Predictive ROI, and a digital marketing authority, speaker, educator, and bestselling author two books, The Small Business Owner’s Handbook to Search Engine Optimization and Increase Online Sales through Viral Social Networking. His digital marketing insights have been featured in Inc. Magazine, Forbes, Entrepreneur, and The Washington Post. Stephen’s practical and tactical training sessions and keynote presentations teach the valuable principle of predicting and then measuring financial return on investment (ROI) before any action is taken. He has also developed a mathematical, patent-pending process that can be used to predict the increase in online sales a business can achieve based on his methods.